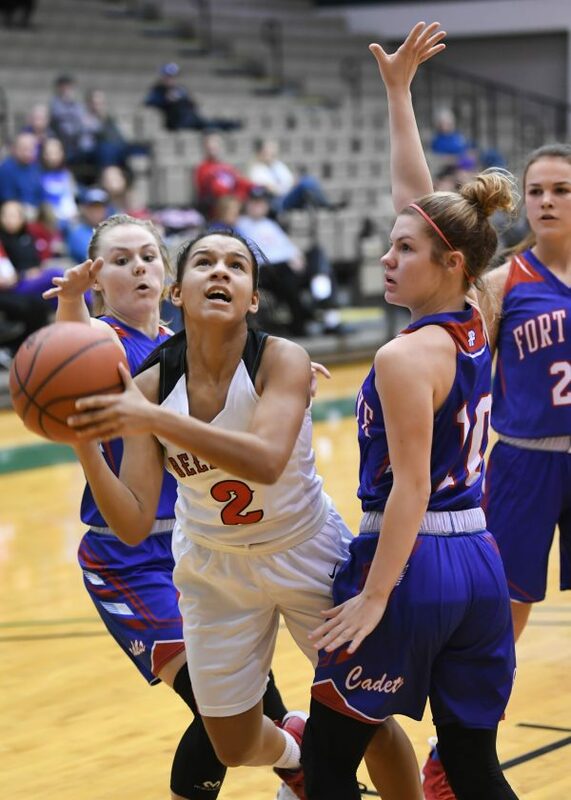 Bellaire’s Kat Davis (2) spilits a pair of Fort Frye defenders during Saturday’s Class 3A final at the Wheeling Hospital OVAC Girls Basketball Championships at Ohio University Eastern. Davis paced the Big Reds with 17 points en route to winning the John Howell Memorial Most Valuable Player Award. Bellaire won its eighth OVAC crown and first in 13 years. ST. CLAIRSVILLE — After two years of knocking on the door to an OVAC championship, Bellaire finally broke it down Saturday morning. The Big Reds — semifinalists two years ago and finalists last season — held off a furious fourth-quarter rally by Fort Frye in claiming a 36-34 victory in the Wheeling Hospital OVAC Girls Basketball Championships Class 3A final, capturing the school’s first conference crown in 13 years, first in the playoff era, and eighth overall. “They’ve worked hard, not just this season, but in all the offseasons to prepare for this,” Bellaire head coach John Farrier said after spending almost five minutes posing for team photos with his victorious hoopsters on the OUE Health, Physical Education and Recreation Center floor. “Anything they’ve achieved they’ve worked for, and I just couldn’t be more proud of a group. After trailing by as many as 10 in the second half, the Cadets (16-3) had an opportunity to tie or win the game in the closing seconds. Inbounding the ball under the basket with 3.9 ticks left, Fort Frye got the ball to Morgan Borich on the right wing. But her shot failed to draw net, sending the Bellaire bench into a frenzy. “We were right there,” said veteran Cadets head coach Dan Liedtke, who’s directed his program to five of its nine OVAC crowns, the last coming three years ago. “We were looking for a good shot from our hot shooter. She’s a senior and we put it in her hands. “She was a little off balance. They got close enough to her where she had to take a dribble to the side. But I would bet money on that shot. Bellaire (18-2) jumped out to a nine-point, first-quarter lead behind eight points from senior Maci Crozier, who was feeling it from mid-range. The Cadets scored the final four points of the first and extended their momentum into the second, scoring 10 of the first 12 points of the period to go up 18-16. Hannah Archer, who finished with a team-high 10 points, had two buckets in the spurt. Mackenzie Dalton’s layup ended the run — and gave Fort Frye the lead — with 21 seconds left in the half. Then, Kat Davis took over. Davis, a junior guard, made a 3-point play a short time later giving Bellaire the lead. Then, she stole the ensuing inbounds pass and was fouled. Her two free throws put the Big Reds up 21-18 at halftime. Bellaire scored the first seven points of th second half to go up 28-18. It’s defense also came to the fore, holding the Cadets to four points in the period and one field goal. Especially on a day where neither team’s offenses were clicking. Bellaire went cold during the final three minutes, only getting a Michaela Flaherty layup, one that put Bellaire up 36-31. Archer drained a 3 from the left side with 2:21 left, but the Big Reds stood strong the rest of the way to bring home the title. “They dug in,” Farrier said of his team’s defensive effort in the closing moments. “That’s what they’ve doing all year.